This weekend you can find Xûr hanging out at the Hangar in the Tower. View more vendor/activity details, news, and more below. Destiny 2 | XUR LOCATION & EXOTIC LOOT! 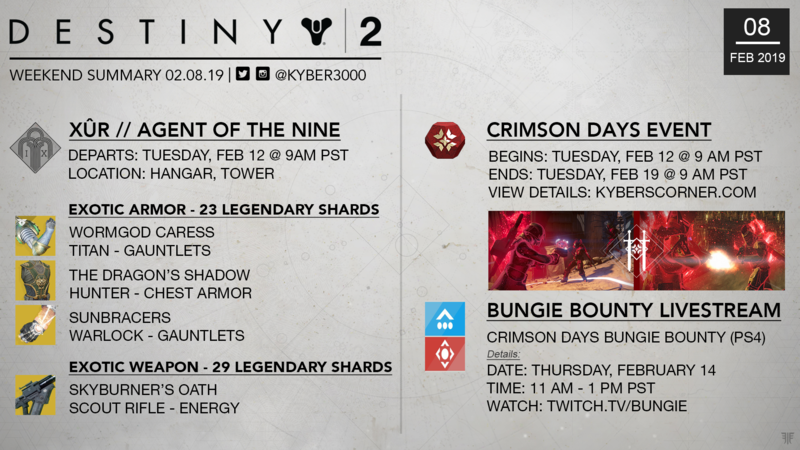 New Inventory, Exotic Rolls & Where is Xur, 8th Feb 2019! by xHOUNDISHx << Click link to subscribe for more Destiny 2 videos! Come watch as Cozmo and DMG04 dive in to the Crimson Days playlist on PlayStation 4.